About 3 months ago, I am sure we all heard the now famous (if embarrasingly annoying) hit by Tarkan, you know the one I mean, the one that many people have now covered, you know the one, the one that stops in the middle as the singer goes "Boos! Boos!" Yeah that one. Well, if at fiirst you thought it was cute and amuzing, you're not alone. A lot of us thought so, but like the many one-hit-wonders we have come to aqccept as the modern pop music norm, we let him come and go. But in his latest album "Karma", Tarkan brings his music and the whole Turkish pop music scene to a different and exciting level. For us it's cool because many of us can relate to the Turkish language. We have grown up hearing the distinctive accent and we all know what an eshak is! 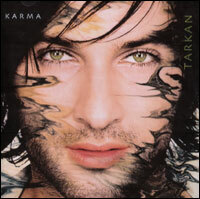 The New Album by Tarkan, "Karma"
Not since the Gipsy Kings and Alabina kicked in the doors to our predominantly Black Cats, Sandy, Siavash and Andy driven parties, has a non-Iranian pop sensation made such an impression. How do I describe the music? Okay here it goes: Take Aha, mix it up with Jean Michel Jarre and now do it all with a Turkish accent, and you've got Tarkan's latest album. At once, superbly hip techno, but with the saaz, ney and ood sounds with those seductive rythms we all know (some of us too well!). Tarkan has created a damn good album, one I cannot stop listening to. Suffice it to say, if you are the type of person who gets off when people stop you and ask, "Hey, what is that awesome music ? ", then you are going to want to own this album. Yes, I said own it. You can't get this album on MP3 yet, and by the time you do, you'll be left out, and everyone will already know. So go buy it. So what does the 8 - 9 - 5 - 2 - 12 mean? Why the UTO (Ultimate Track Order) of course! Bruce Bahmani is a frequent contributor and good friend of The Iranian. See his other features here. Bahmani lives, writes and listens to music in the San Francisco Bay Area. He also designs websites, which explains why this page looks different (much better) than what you usually see on iranian.com.